Verhaeghe | Beer Apprentice - Craft Beer News, Reviews, Interviews and Info. It’s time for another craft beer review everyone and today I’m going to be reviewing a classic. Well, a classic in the eyes of a lot of people anyway. For this tasting I’m pouring the Duchesse De Bourgogne brewed by the Brouwerij Verhaeghe situated in Vichte, Belgium. Let’s just go ahead and get to the website, proximedia.com, and see what they have to say about this beer. Nice!!! Let’s get to it. This beer came in a 25.4 oz. bottle with an ABV of 6.2%. It poured a deep burgundy/deep brown mixture of color. A relatively easy discharge produced a very rocky, soft, fluffy, soapy, light tan head. It was wonderfully sized with a great retention time. As the crown receded it left behind some very attractive, patchy lacing. The nose was very earthy. Stale musty notes with a very light sourness. A delightful hint of wood along with a slight tone of black cherry and other unidentified dark fruits. Deeper into the aroma it had a spicy bread type of fragrance. Almost like rye. Whatever it was totally complimented the overall profile. A very pleasant bouquet on this one for sure. The flavor was very enticing. It was almost like a cherry cola or something. Sweet and sugary at the beginning, which eventually gave way to the woodiness as it warmed. Some delightful, but soft, raisin bread characteristics came through once it opened up too. It wasn’t near as tart or sour as I was expecting it to be, however it divulged enough to keep me wanting another sip. The balance and harmony were spot on I thought. The mouthfeel was medium bodied. Dry and smooth, although somewhat crisp. The carbonation was of the medium strength variety. No warmth or heat from the alcohol, yet a very nice shot of flavor was left behind for me to enjoy between sips. Yeah, this is a great beer. It’s a certified classic. Easily worth a try if you have yet to do so. It may not be as robust as some of the “newer aged/extreme” Sours, but this one is much easier to drink and deserves the utmost respect. It’s very well made, complex and an excellent beer. It seemed to get a little more varied and elaborate as it warmed and opened up. I believe this brew would totally hit the spot during the crisp, cool days of Fall. One interesting thing that I found was that this brew worked the opposite of most Sours that I’ve had. It got more sour and tart as I went along. Most of the time, at least with my experience, the sourness starts strong then the palate adjusts. This one didn’t seem all that sour to begin with, however became more so later. It still wasn’t over the top though. Just pleasant and enjoyable. 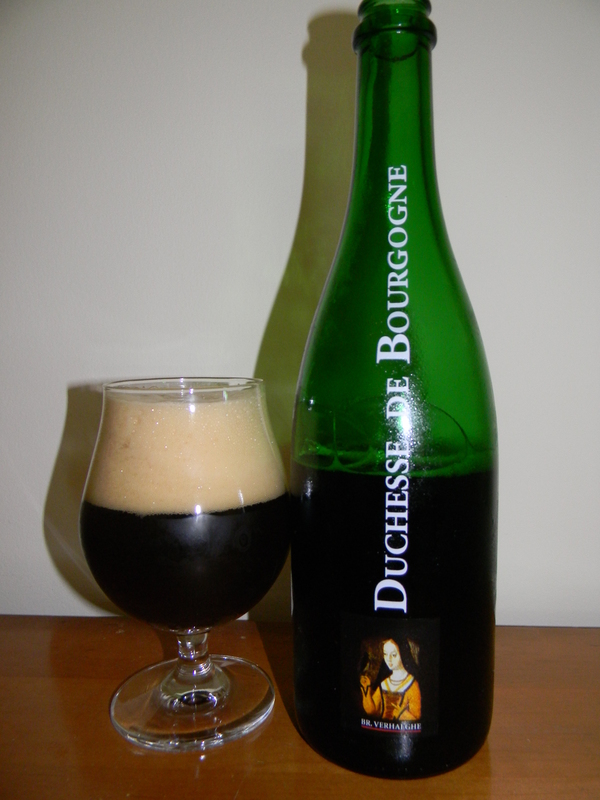 Have you guys had the Duchesse De Bourgogne yet? What did you think of it? Be sure to let me know in the comments.